This recipe is a total delight. I call it Ursi's Lentil Foie Gras because Ursi gave it to me. You can make a vegetarian or a vegan version. Beware, if you make the vegetarian version (with butter) nobody will believe it is vegetarian. Least of all the meat eaters in your life. This is the second recipe that I am sharing from my new book Bread & Spread. You will find the previous one here. 1. Cook the lentils with the cloves in plenty of water until they are done but not mushy. Drain them, retaining the water. 2. Sweat the shallot in the oil on very gentle heat (with the lid on the pan) for a good 5 minutes. Add the marjoram and give it a stir. Turn the heat off. 3. Roast the sunflower seeds in a dry frying pan, being careful not to burn them. When they are done remove them immediately from the pan or they will continue to brown (and burn). 4. Put the lentils and cloves into a magimix or a blender. Add the cold butter and pulse to mix. Add the shallots/marjoram as well as the sunflower seeds, soya sauce. Blend to a fine fine fine puree, adding just enough water, spoon by spoon to make the blender or magimix work. Taste and add salt and pepper to your liking. 5. If you want it even finer, put it through a sieve or a mouli. 6. Decant into an attractive bowl and cover with cling fim. Wait until it has cooled and the put it in the fridge until cold. Eat this with brioche if you are feeling indulgent or a humble whole meal loaf. What a terrible name - totally against humans cruelly feeding ducks - why name it after this horrible practice? I would not normally be drawn to a recipe like this.However, as I have the utmost confidence in Jane Mason’s sense of taste, decided to to test it out. The ingredients are simple and inexpensive but the combination is amazing. 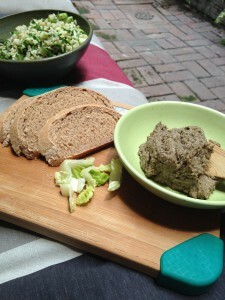 A flavoursome veggie pate that will appeal to carnivores as well. Definately adding this one to my repetoire.